Photo by Steve Kroschel, USFWS. VICTOR, Idaho—(ENEWSPF)–October 17, 2016. The U.S. Fish and Wildlife Service announced today that it is reopening the public-comment period on its 2013 proposed rule to protect North American wolverines as a threatened species under the Endangered Species Act. The agency’s move comes after the Center for Biological Diversity and allies challenged its sudden 2014 decision to withdraw that proposed rule. In response to the lawsuit, the District Court of Montana ruled in April that the withdrawal was illegal and ordered the Service to reconsider the proposed rule. This comment period is a result of that lawsuit. It is estimated that no more than 300 wolverines now remain in the contiguous United States, living in Idaho, Montana and Wyoming. 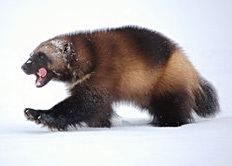 Wolverines require high-elevation areas with persistent snow cover for denning, and climate change threatens the availability of den sites and reproductive success of the species. Last month the Fish and Wildlife Service released a seven-year workplan identifying species that would be evaluated for listing under the Endangered Species Act. This workplan noted that a final decision for wolverines would be issued in 2018. The Center and others first petitioned for the wolverines’ protection in 1995. In litigation the Center was represented by Earthjustice and joined by Conservation Northwest, Friends of the Clearwater, Greater Yellowstone Coalition, Idaho Conservation League, Jackson Hole Conservation Alliance, Klamath-Siskiyou Wildlands Center and Rocky Mountain Wild. The case was consolidated with another case challenging the withdrawal, filed by Defenders of Wildlife.